Whatever type of conference or event you may be planning we can help make it a success. We can plan and organise the venue at one of our centres and will do all that we can to accommodate your exact requirements. 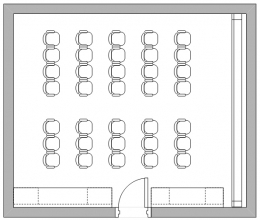 Our conference rooms are configured as shown in the diagram opposite as standard but can be configured to your exact requirements for an additional charge.